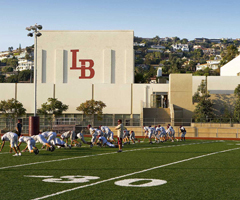 In the Laguna Beach Unified School District, the GATE Program consists of clustering critical masses of GATE students within the heterogeneous classroom, and providing them and other high-achieving students with differentiated ways to learn. ACCELERATION: This is done when students progress at their individual pace, which may mean moving more rapidly through a particular sequence, with the result of receiving curriculum earlier than it would normally be received. Students work on more advanced curricular concepts. ADDING DEPTH: This is done by giving a student the opportunity to extend and elaborate a topic of interest. Going from concrete to abstract, the student uncovers more details and new knowledge during the process. An example would be offering additional resources (book, speakers, periodicals, videos), supporting Howard Gardner's theory of "multiple intelligences" that challenge high-achieving students after a core science unit of the central nervous system. INCREASING COMPLEXITY: This is done by enabling students to view concepts at a more sophisticated level, analyzing and evaluating issues, problems, themes, and relationships from different perspectives. An example would be using a variety of resources to investigate Abraham Lincoln's campaign and election to the presidency in 1860, then analyzing ways it was different, and/or the same as President Bush's campaign and election over 130 years later. PROVIDING OPPORTUNITIES FOR NOVELTY: This is done by providing students with an opportunity to motivate their own learning because of a need they have to learn more. The approach to learning is personalized and varies from student-to-student. Students test their ideas with one another and against established interpretations. An example would be a student who studies current political issues, develops a new method for raising campaign funds, and submits the idea to a congressman for reaction. Ask your child’s teacher for some of the specific ways that he/she is differentiating the curriculum to fit the needs of your child.